It was all pretty surreal. June was yet to end, those long school summer holidays barely under way and yet here we were, readying ourselves for Hibs’ first pre-season friendly. Needs must, of course, and with the start of their Europea League campaign less than three weeks away, it was vital Pat Fenlon’s players began to get game time under their belts, that necessity all the more crucial given their second qualifying round opponents, either Ireland’s Drogheda or Malmo of Sweden, are already midway through their respective seasons. Hence we found ourselves sitting in the shadow of Dumbarton Rock barely a scant five weeks after Hibs’ Scottish Cup showdown against Celtic, the fact this match was taking place only a few days after the longest 24 hours of the year no reason for the fans to be slapping on the Ambre Solaire. Fenlon takes his players to sunnier climes this week, matches against Gibraltar’s international side beneath that rock which juts out into the Mediterranean, and Nottingham Forest in Portugal’s Algarve, pencilled in to help hone both fitness and sharpness before the Capital club return to complete their Euro preparations in the perhaps less welcoming environs of Kirkcaldy. To that end, the 1-1 draw with Ian Murray’s First Division side was of secondary importance, Fenlon taking the opporunity to give the few hundred Hibs supporters who had travelled west their first glimpse of new signings Liam Craig and Owain Tudur Jones in a starting XI which bore little resemblance to that which took the field at Hampden at the end of May. Shorn of the services of strikers Leigh Griffiths and Eoin Doyle along with midfield powerhouse Gary Deegan, Fenlon was also without Ryan McGivern and Tim Clancy – injury concerns explaining their absence – while both David Wotherspoon and Alan Maybury contemplate their futures. As such, Hibs’ much-envied conveyor belt of homegrown talent was much in evidence, no fewer than six who’d “come through the system,” taking to the field, Lewis Stevenson and Paul Hanlon adding a touch more experience to the appearances of Bradley Donaldson, Jordon Forster, Alex Harris and Danny Handling while three more youngsters – namely Sammy Stanton, Ross Caldwell and Dean Horribine – were given second half run-outs as they, too, seek to establish themselves in Fenlon’s plans for the coming campaign. Little time, though, for his players to shake off any rustiness, although, as Fenlon observed, today’s players tend to report back in reasonable shape, his possibly more so than others given the brevity of the break they’ve had this time round. Even so, Fenlon and his backroom staff have to strike that fine balance between rigorous training sessions and game time, the manager saying: “We’ve tried to make sure trainings has been of a good quality, We’ve worked them hard, a lot of ball stuff and, obviously, fitness, but we knew that some of them might get a bit ‘leggy’ towards the end of this match. Fenlon appreciated the assistance offered by Murray in agreeing to the match, Dumbarton’s first league game not until August 10 when they host Falkirk. Indeed, this friendly came so early the ex-Hibs star had a number of players still on holiday, while others were playing for nothing as their contracts wait to kick in. 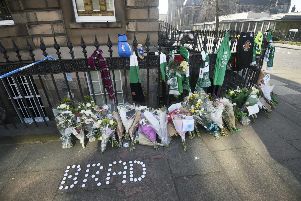 He, too, would have been happy with what he saw although, as Fenlon said, the 90 minutes were probably of more benefit to Hibs given their need to come up to speed in double-quick time if they are to harbour any hope of making progress on the European stage. Having survived a first-half scare in which Dumbarton’s Kevin Smith lofted the ball over goalkeeper Ben Williams only to see it hit the post, Hibs took the lead, rather fortuitously, through Harris, his shot saved by Jamie Ewings only for the ball to break back off the Easter Road kid and roll into the net. A touch of luck there may have been, but there was no doubting the quality of the pass or vision displayed by Handling in carving out the opportunity. Two minutes later, though, Dumbarton were level, Mich Megginson’s scuffed low cross catching Hibs’ defence flat-footed as Ally McKerracher found space to steer it home. Dumbarton, though, had Ewings to thank for keeping them level, the goalkeeper pulling off impressive saves from Scott Robertson, Handling and Craig, while he enjoyed a touch of good fortune as Stanton’s rising shot clipped the bar and went over rather than in. Dumbarton: Grindlay (Ewings 46), McGinn, McNiff, S Smith, Horne (Coleman 64), Phinn, Turner (Prunty 60), Agnew, K Smith, Megginson (Halmsamn 74), McKerracher. Sub not used: Ross. Hibs: Williams, Donaldson, Forster (McPake 68), Hanlon, Stevenson, Harris (Stanton 74), Tudur Jones, Taiwo (Robertson 66), Craig (Horribine 83), Handling, Cairney (Caldwell 46). Subs not used: Murdoch, Gold.